Georgia O'Keeffe spent almost 40 years of her life in the American Southwest. Her two houses in New Mexico; at Ghost Ranch and Abiquiu and the landscapes around them became essential elements in her paintings. The mountains and arroyos, the skulls and the Jimson weeds, a ladder against a wall, a door; all transformed by her genius into a quintessentially American art. Astonishingly, the history of these houses has never before been written. In this volume, Barbara Buhler Lynes and Agapita Judy Lopez create a vibrant picture of O'Keeffe at home. Drawing on O'Keeffe's correspondence, Lynes and Lopez set forth their fascinating story. An essay by architect Beverly Spears describes the distinctive characteristics of adobe architecture and its construction, and the many individuals involved with the house are identified. An appendix provides valuable information about the materials used in resorting the Abiquiu house. Photographs made especially for this book show the houses as they are today, plus dozens of photographs made by major photographers during her life show her living in the houses. Photographs of her painting and specific architectural components of the Abiquiu house are also included. 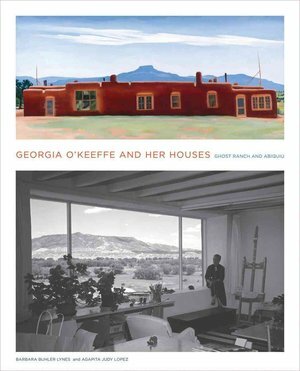 These photographs and their accompanying texts offer for the first time a compelling picture of O'Keeffe's life in New Mexico, how each house satisfied different aspects of the artist's personal and professional needs and how O'Keeffe gradually transformed these Spanish Pueblo Revival style houses to reflect her modernist aesthetic.